"Here’s some red meat for fans of the piano trio... the lyricism of Bill Evans with the joyful bounce of Gene Harris. All of the material here is organically grown and produced, and covers the waterfront of dynamics and moods... Check these guys out, you won’t be disappointed." Here’s some red meat for fans of the piano trio. Consisting of Matthew Fries/p, Phil Paolmbi/b and Keith Hall/dr, the Tri-Fi trio mixes the lyricism of Bill Evans with the joyful bounce of Gene Harris. All of the material here is organically grown and produced, and covers the waterfront of dynamics and moods. Cheerful and upbeat material such as the gently driving “Circle Dance” and optimistic “Open Water” highlight Fries’ gracious touch on the ivories, while “Cielo” and “Song for Butterfly” have a mellifluous spaciousness that kicks up the High Beta Waves. 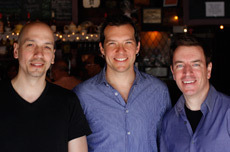 A funky “Airstream” and innocent “Clockwork” capture innocent moods with bouyancy, as well as the title track showing the band delivering with some exertion. There is some symbiotic interplay between the gents, with Palombi’s bass doing some nice lines on the thoughtful “The Nightwatch” and leading with his shoulders before Hall kicks in on the driving “Josie Bebop.” Check these guys out, you won’t be disappointed.